Logan Airport (BOS) is based in East Boston and is one of America's busiest airports. Boston Airport serves the city, and the wider New England area, with domestic and international flights to destinations around the world. Just four miles northeast of the city of Boston, Boston Logan Airport is easy to connect to and from by road, rail or sea and is host to numerous car rental companies. Boston's MBTA runs between a newly-refurbished station at the airport and South Station, in downtown Boston. The Logan Shuttle - a bus service - connects the water transportation terminal, terminal buildings, MBTA station and economy parking lots. Parking at Boston International Airport is easy with a range of short term and long term lots available. Boston Logan has four terminals and six hubs, making it the major transport point for New England with its extensive array of services, facilities, shops and restaurants. 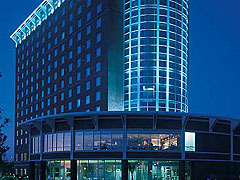 The Exchange Convention Center is based at Logan International Airport and is well-equipped for meetings and events of any size. Boston Logan World Airport Guide provides you with access to a complete selection of Boston airport hotels. Utilize the discounts offered directly from the hotel, with the assurance of secure booking. Extra services include airport car rental, airport car parking, and flights to and from Logan International Airport. Please note: The term Boston Logan International Airport BOS as well as all associated graphics, logos, and/or other trademarks, tradenames or copyrights are the property of the Boston Airport authority and are used herein for factual descriptive purposes only. We are in no way associated with or authorized by the Boston Airport authority and neither that entity nor any of its affiliates have licensed or endorsed us.